On a more practical note, duck is also easier to find in stores than you might assume, and it’s not hard to cook. If you can cook a chicken, you can cook a duck. Take a look at the nutritional selling points, and then check out some recipes for trying it yourself. Duck is a little bit of an anomaly in the world of meat. On the one hand, it’s technically from a bird. But it doesn’t actually fit the wheat-meat nutritional profile that most people associate with poultry. Nutritionally, duck is a little fattier than chicken or turkey, and from a Paleo perspective, that fat is a lot healthier. 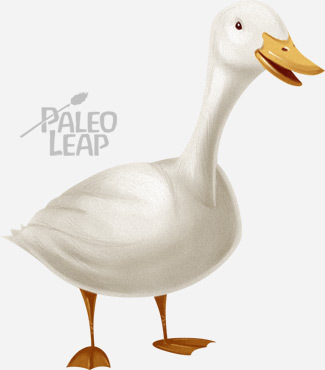 Duck fat is better for you by Paleo standards because it has less PUFA and more saturated and monounsaturated fat. Duck is a little bit like a halfway fat, in between the fat profiles of red meat and more typical poultry. What if I Don’t Want Huge Amounts of Fat? Moving on to the micronutrient side of things, duck can also hold its own with the best. Particularly notable nutrients include B vitamins, iron, and the antioxidant mineral selenium. Selenium is otherwise mostly available from fish and seafood, but if you’re not big on tuna and shrimp, duck can fill in that gap. Fresh ducks are hard to find in most grocery stores, but there’s a secret to finding them almost anywhere: check the freezer. Most people don’t really check the frozen meat section beyond the enormous bags of chicken breast and maybe some shrimp. That’s their loss. You can find all kinds of little treasures back there, usually including a whole duck (and sometimes also a container of duck fat, which you should absolutely snap up if you have the money, because it’s arguably even more delicious than butter). 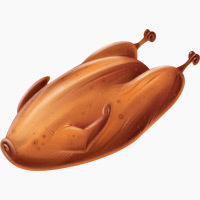 Some grocery stores also sell just duck breasts or just duck legs. Asian markets may have a wider selection, if you’re interested in expanding your grocery game. If you can cook a chicken, you can cook a duck. It’s not like a turkey, where you lug it home and then have to deal with an enormous bird demanding hours of time and attention. Ducks are small and their relatively high fat content makes them forgiving of imprecisions in cooking time. Cure-your-own Duck Ham (And Here we Are) – it’s easier than you think. Another classic way to go is duck confit, which puts all that luxurious duck fat to work in service of your taste buds – and also in service of preserving the duck. In fact, it’s one of the ways people used to preserve meat before they had reliable refrigeration: just keep it safe under a thick layer of cooled fat. Duck has a solid nutritional profile, full of healthy fat and fairly low in inflammatory PUFA. It’s particularly great for low-carbers who want a big chunk of fat with their meals, but it fits just fine into pretty much any Paleo template. If you don’t want all the fat right away in one meal, just save the fattiest bits to render into pure duck fat, and use them later for roasting vegetables. Except for Asian cuisine, duck is uncommon enough in the US to be special, so it’s an easy way to cook something fancy or memorable without actually doing a huge amount of work. …Plus, after cooking your first duck, you get to feel like a total apex predator every time you walk past a duck pond and see the mallards quacking away. That’s always fun.